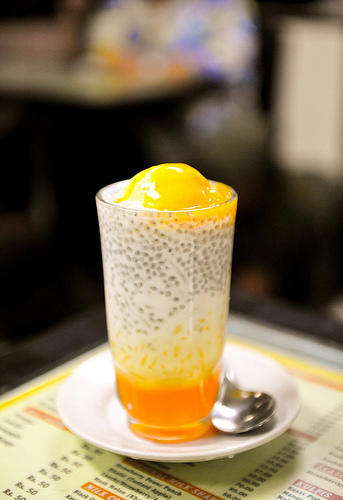 falooda is a royal dish.this falooda haves a twist of mango. In a pan cook milk with custard powder,stir it continuously so that no lumps are formed. cook till the milk is thickened.keep aside to cool. Soak falooda seeds in ½ litre water for 30 mins. Heat water in a pan and cook the falooda sev,drain and keep aside. Now take 4 glasses add 1 tbsp of mango syrup in each. Spread the sev and falooda seeds in glasses.